Kitarô KÔSAKA joined studio Oh! Production right after leaving Fukaya highschool, in Saitama prefecture. 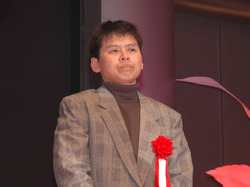 He started as an animation director on the series Sherlock Hound (1984-1985) and began to work as a freelancer in 1986. The quality of his work awarded him the trust of mangaka Naoki URASAWA and he worked on the TV adaptations of his works: Master Keaton (1998-1999), Yawara! (1989-1992), and Monster (2004), as a chara-designer, producer, and animation director. His career as a film director started with Nasu: Summer in Andalusia in 2003. The film was selected for the Cannes Film Festival, a first for a Japanese animation film. Kitarô KÔSAKA then worked on the sequel of the film, Nasu: A Migratory Bird with Suitcase, released as an OAV in 2007, as a director, screenwriter, and chara-designer. The most striking in Kitarô KÔSAKA's career is definitely his many collaborations with Studio Ghibli. He started early as a key animator on Nausicaä of the Valley of the Wind (1984), and then Castle in the Sky (1986), Grave of the Fireflies (1988), and Pom Poko (1994). He then became in charge of the animation on Whisper of the Heart (1995), Princess Mononoke (1997), Spirited Away (2001), Howl's Moving Castle (2004), From Up on Poppy Hill (2011), and also for Ponyo (2008). In 2013, he is in charge of the animation again for The Wind Rises, the latest film by Hayao MIYAZAKI, released on January 22, 2014 in France and which has been announced as a nominee for the Oscar of Animated Feature Film!